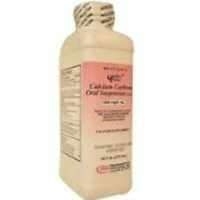 Calcium Carbonate Oral Suspension, 16 fl. oz. Calcium Carbonate Oral Suspension - 16 fl. oz. Two teaspoonfuls (10mL) of suspension provides 1000mg of calcium – 100% of U.S.RDA for adults and children 12 or more years of age. Keep out of reach of children. In case of accidental overdose, seek professional assistance or contact a Poison Control Center right away. Calcium Saccharin, Citric Acid, D&C Red No. 33, FD&C Red No. 40, Flavoring, Glycerin, Methylparaben , Propylene, Glycol, Propylparaben, Purified Water, Sorbitol and Xanthan Gum.